The Law Offices of Todd D. Beauregard, P.C. can help you understand the issues related to documenting a proper will in Massachusetts. Leaving your hard-earned assets to the people of your choice, as opposed to the choices a Probate Court may decide. By applying your unique facts to the probate law we can help clients evaluate their estate and to direct the legacy to the people of your choice. This process requires trained professionals, skilled to work within the probate law so the client can decide how their desired result can best be achieved. An estate is everything you own (known as ‘assets’). At death, these assets are transferred (conveyed) to the new owner either by Court decision (probate), or by you (outside of probate). With a valid will, you decide who gets what. To control how your hard-earned assets will be conveyed, you must have a valid will. Reviewing your will periodically insures it meets the changing conditions that best serve your interests. Can I make specific bequests to certain people of certain assets? In a will, this is precisely what you do, to make certain your wishes are followed. What does “probate transfer” mean? Ownership of assets takes place by Court order, or outside of probate, which means at your election. In transfers out-of-probate, property passes to the new owner(s) by way of how the property was titled, or by way of designated beneficiary. During one’s lifetime, the person who died decided in advance how the property would be conveyed. In a probate transfer, the decedent’s property passes to the specific individuals mentioned in a will or according to the Massachusetts laws of inheritance (Uniform Probate Code) if no will has been made or if the will made was found invalid or unenforceable. Why should I consider drawing up a Will? For those who die without a will (said to die intestate), it is the Probate Court who decides who manages the estate and transfers the decedent’s assets. In the event the Court cannot find or contact beneficiaries, one’s estate risks going to the state (escheats). 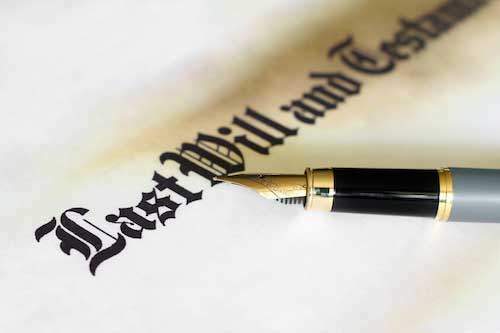 Unlike a living will, a will is a legally recognized declaration by which a person, the testator, names one or more persons to manage his estate and provides for the disposal of his/her property upon death.